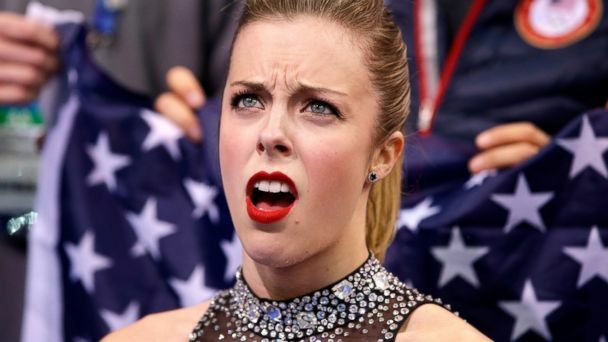 U.S. figure skater Ashley Wagner may have one-upped McKayla Maroney's "not impressed" look, which became a viral hit at the 2012 Summer Olympics. Wagner, 22, became a prime target in the world of Internet memes today when she went from euphoria to total disappoint within minutes. Her facial expressions tell the whole story. After the event, Wagner spoke to reporters about her performance. "To score that low was very disappointing for me," she said, according to The Associated Press. "But honestly, this was more about me and my performance and proving to everyone that I belong here." The score put her in fourth place in the standings, and - despite her disappointment - was enough to help the U.S. advance.